English Teaching Assistant Blair Daly in Malaysia coaching his team at Tengku Ampuan Intan Secondary School in 2011. Blair Daly owes his interest in Malaysia to one of his professors at Whitworth University. Inspired by his professor’s stories of serving in the Peace Corps in Malaysia, Daly spent a semester in 2009 studying in the Faculty of Social Sciences at Universiti Malaysia Sarawak. In 2011, after he graduated from Whitworth University, he accepted a Fulbright English Teaching Assisting Program position in Malaysia. 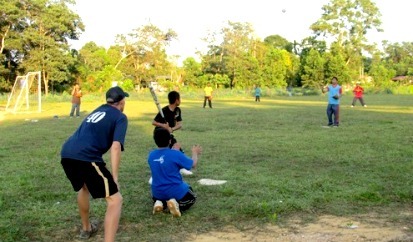 Daley’s experience as an ETA in Malaysia was enriched through coaching softball, a sport unknown to most at the Tengku Ampuan Intan Secondary School (SMKTAI) in the quiet countryside of Terengganu state.